Abby Ellin was shocked to learn that her fiancé was leading a secret life. But as she soon discovered, double lives are everywhere. 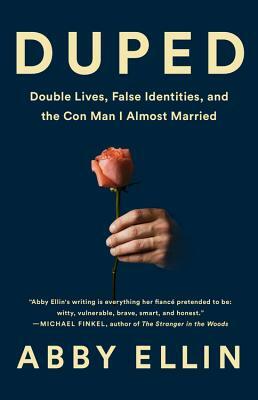 In Duped, Ellin plunges headlong into the world of double lives. Studying the art and science of lying, talking to women who’ve had their worlds upended by men who weren’t who they professed to be, and writing with great openness about her own mistakes, she lays the phenomenon bare. These remarkable–yet surprisingly common–stories reveal just how strange and improbable our everyday lives really are. Abby Ellin is an award-winning journalist and the author of Teenage Waistland: A Former Fat Kid Weighs In On Living Large, Losing Weight and How Parents Can (and Can’t) Help. For five years she wrote the “Preludes” column about young people and money for the Sunday Money and Business section of the New York Times. She is also a regular contributor to the Health, Style, Business and Education sections of the New York Times. Her work has been published in The New York Times Magazine, New York, the Wall Street Journal, the Los Angeles Times Magazine, and many others.